We received a dehydrator as a late wedding (or eloping) gift and despite our excitement to use it, it sat around for a while. Finally about a year ago we experimented with making our our own jerky and it turned out great! It is so much cheaper to make it yourself than buying it too. Plus, when you make it yourself you get to add your own flavors. 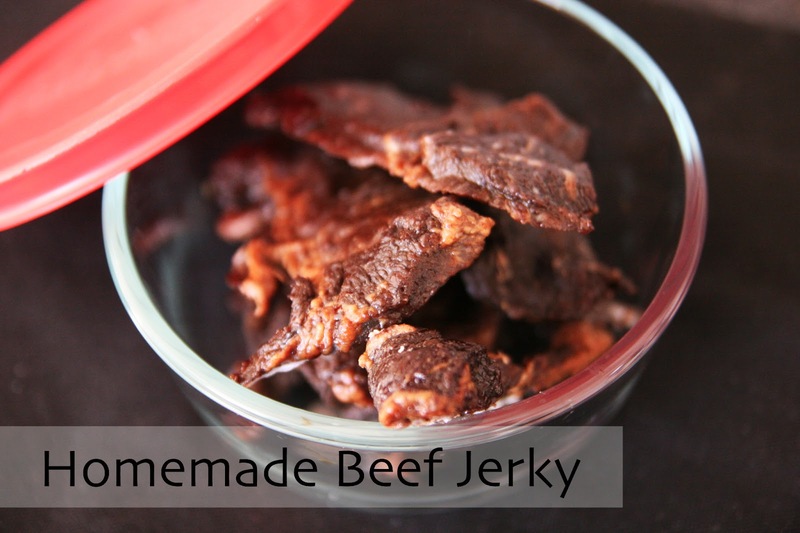 We've experimented making jerky using ground beef, flank skirt steak that we bought thinly cut, and chuck roast. The chuck roast (we cut it ourselves) and thinly cut flank both have worked really well. The ground beef worked, but it made a very awkward jerky. We won't do that again. Our recipe is always changing, but that is the great thing about beef jerky. It is good to have a base recipe to use, but then you can add other spices or hot sauces that may suit your tastes better. The recipe below is our base recipe. Andy loves to add hot sauce while I prefer more of a smoky garlic taste. We cut the meat into 1/4-1/2 inch thick strips and mix them with everything above. Let the meat sit overnight in the fridge to marinate. Lay the meat strips out on the dehydrator and turn it up to the highest temperature. We let it go for about 4 hours and then check it. Sometimes you'll have to rotate the shelves. Then we'll let it go for another 2-3 hours. About 6-7 hours in total. That's it! It looks like it's still moist/wet/raw in the final form. Is it totally dried out? How long will it keep? I would love to make a solar dryer to do that. You'll have to make one and do a blog about that. I also want to make a solar oven for baking bread in the summer outside.